Religion has certainly played a significant role in the propagation of Western music in the country. It is believed that the history of Christian religious music in the Philippines began when the first mass in the country was held on March 31, 1521, Easter Sunday, in thanksgiving for the safe arrival of Magellan and his party. It was during this occasion that the natives were able to hear the chants of a mass for the first time. The first sounds of church music that the natives heard was the Gregorian or plainchant, which represents one of the oldest surviving Western music traditions. Later on, more elaborate music such as polyphonic and harmonic styles was also performed. Friar musicians composed songs for religious purposes such as hymns, chants, and Christmas songs. Fr. Manuel Arostegui, a notable composer and conductor in both Spain and Manila, was referred to as “Agustino Filipino” and became known for the many religious compositions he wrote, including: a grand mass for full orchestra, with organ or piano and four or eight voices; “O Salustaris Hostia” and “Motete al Sissmo” (1885) for solo baritone, with violin and harmonium accompaniment; “Salve” (1885) for three voices, with organ or piano accompaniment; “Flores de Maria” (1885) for three voices, with organ for harmonium accompaniment; and “Ave Maria” (1886) for tenor solo with piano or harmonium accompaniment. Convents and colleges run by different religious orders such as the Augustinian, Franciscan, Jesuit, Dominican, and Recollect orders, served as centers of musical culture during the early days of Catholicism in the country. Priests trained young boys on music and playing instruments, as well as making the instruments themselves. 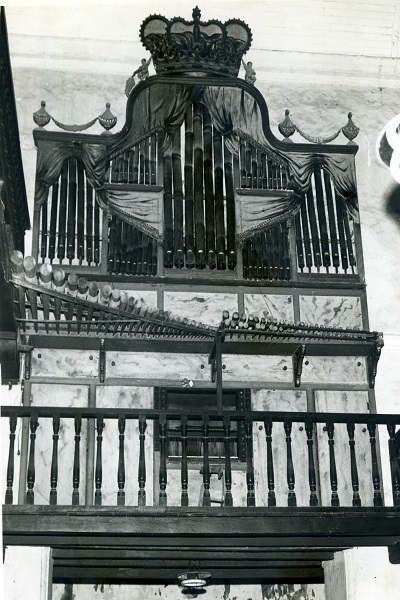 Among the well known legacy of the Recollects is the famous Bamboo Organ of Las Piñas, built by Fr. Diego Cera de la Virgen del Carmen in 1816 with the help of the natives. Outside of the confines of the church, religious music was also heard in the community and became part of rituals associated with Catholic faith, including the pasyon, sinakulo, Flores de Mayo, salubong, santacruzan, and panuluyan, among others. Moreover, because of the opportunity to utilize music both in the service of the church and the community, several Filipino musical composers and performers flourished, who eventually contributed to the evolution of folk music. Hila, A.C. (2004). Music in History,History in Music. Manila: University of Santo Tomas Publishing. Tiongson, N. (Ed.). (1994). CCP Encyclopedia of Philippine Art (Vol. 6: Philippine music). Manila: Cultural Center of the Philippines.